Organised by Christ For The Nations UK and hosted at the Royal Norfolk Hotel, the very first Bognor Regis Bible Week was a definite success. Through the excellent speakers, and heart-felt worship, the Lord spoke afresh about the need to have a people after His own heart, casting up a Highway to their God. We were very blessed to have some truly anointed speakers throughout the week. Derek Tidball, the principal of the London School of Theology, gave the morning Bible study, and took us through the book of Micah. The five morning Bible studies are available individually as well as in a 5-CD set. The evening Bible studies were given by a range of well known speakers (Lyndon Bowring, Dr Clifford Hill, David and Mary Pytches, Roger & Sue Mitchell and Greg Haslam) and are all well worth a listen. 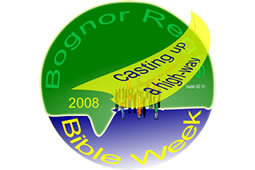 All 11 of the studies given at the Bognor Regis Bible Week 2008 are available as an 11-Disc set. At only £25.00, this collection represents a fantastic bargain! The MP3 CD of all 11 of the studies given at the Bognor Regis Bible Week 2008. All 5 of the morning Bible studies given by Derek Tidball going through the book of Micah, entitled 'The God Who Melts Mountains'. All 5 of the morning Bible studies given by Derek Tidball going through the book of Micah, entitled 'The God Who Melts Mountains' on MP3 CD. The first of the morning Bible studies from the Bognor Regis Bible Week 2008, entitled 'The God Who Melts Mountains - Part 1: Wounds Too Deep To Heal'. In this talk Derek walks the listen through the first two Chapters of the book of Micah. The God Who Melts Mountains Part 2: Where Are We Heading? The second of the morning Bible studies from the Bognor Regis Bible Week 2008, entitled 'The God Who Melts Mountains - Part 2: Where Are We Heading?'. In this talk Derek walks the listen through the end of chapter two and into chapter three of the book of Micah. The God Who Melts Mountains Part 3: God's Now! The third of the morning Bible studies from the Bognor Regis Bible Week 2008, entitled 'The God Who Melts Mountains - Part 3: God's Now!'. In this talk Derek walks the listen through the Chapters four and five of the book of Micah. The God Who Melts Mountains Part 4: What Does God Want? The penultimate morning Bible studies from the Bognor Regis Bible Week 2008, entitled 'The God Who Melts Mountains - Part 4: What Does God Want?'. In this talk Derek walks the listen through Chapter six of the book of Micah. The God Who Melts Mountains Part 5: Is There Another God Like This? The last of the morning Bible studies from the Bognor Regis Bible Week 2008, entitled 'The God Who Melts Mountains - Part 5: Is There Another God Like This?'. In this talk Derek walks the listen through the final Chapter of the book of Micah. The opening talk of the Bognor Regis Bible Week 2008, given on the Saturday evening and entitled 'Our Gospel Responsibilities'. What is God Saying to the Nation? Dr Clifford Hill gave this talk on the Sunday evening talk of the Bognor Regis Bible Week 2008, entitled 'What is God saying to the Nation?'. Given on the Monday evening of the Bognor Regis Bible Week 2008 and entitled 'Forsaken', David shared from His experience of 50 years of ministry, having pastored Churches across the globe. Given on the Tuesday evening of the Bognor Regis Bible Week 2008, Mary Pytches recalls the story of the prostitute who wiped Jesus' feet clean with her tears. With insight from her years of ministry, both in this country and abroad, Mary encourages us to return to our first love. Given on the Wednesday evening of the Bognor Regis Bible Week 2008, Roger and Sue Mitchell encourage people to be aware of what God is doing in the nation. There is a need for a fresh move of God, from the youngest to the oldest, and a time of rebuilding the highways that bring people back to the Lord, which have become deserted. Given on the Thursday evening of the Bognor Regis Bible Week 2008, Greg Haslam studies the need for 'fresh oil' looking at Exodus and seeing just what work the oil, representative of the Holy Spirit, was to perform and just how necessary it was to ensure that it was kept fresh.